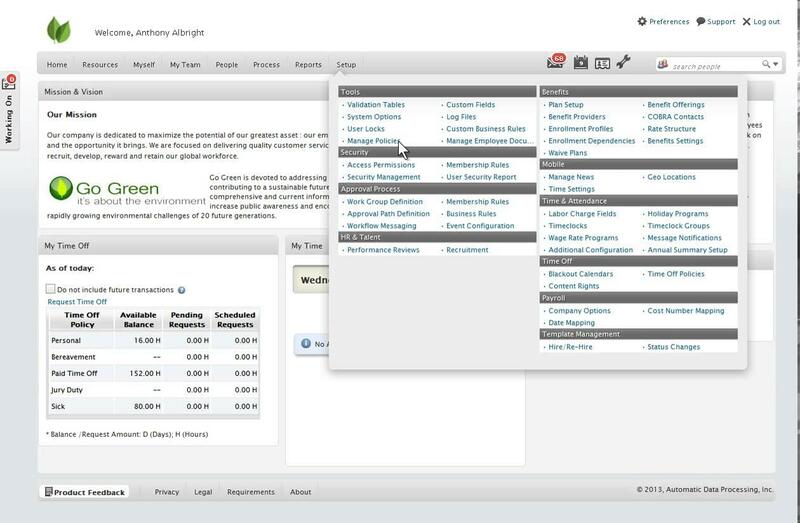 ADP Workforce Now is human capital management software for businesses with 50 or more employees. Its software provides support for everything from payroll to Affordable Care Act compliance. ADP Workforce Now’s Global Human Resource System of Record provides support to more than 30 countries with multilingual and multi-currency, allowing businesses to manage employees all over the world. ADP’s human capital management software allows businesses to improve the calculation of hours worked for each employee. It makes time tracking easier and has self-service tools for employees to use. The software has automated time-collecting reports that provide a documented record of hours worked and automated scheduling to prevent unauthorized work and call attention to attendance issues. The software also has a geolocation feature that allows employees to clock in and out remotely. This allows businesses to monitor if employees are working during their assigned schedules. This talent management software often helps businesses retain top employees by uncovering top job candidates on social media. The software sheds light on knowledge caps and areas of excellence too. This also helps businesses make the hiring process more efficient. ADP is an American provider of business outsourcing solutions. It is one of the largest providers of business processing and cloud-based solutions. It provides software for payroll, talent management, human resource management, benefits administration, and time and attendance. Learn everything you need to know about ADP Workforce Now. Our experts will reach out to you shortly.